A lifelong friend of Kurt Vonnegut’s, Dan Wakefield both edited and wrote the Introduction to the bestselling collection of Vonnegut’s personal correspondence, Kurt Vonnegut: Letters. In addition, Wakefield is the author of the memoir New York in the Fifties, which was made into a documentary film, as well as Returning: A Spiritual Journey. He created the NBC prime time series “James at Fifteen” and wrote the script for the movie based on his novel Going All The Way, starring Ben Affleck. Now available from the Sliver of Stone contributor: IF THIS ISN’T NICE, WHAT IS? Master storyteller and satirist Kurt Vonnegut was one of the most in-demand commencement speakers of his time. For each occasion, Vonnegut’s words were unfailingly unique, insightful, and witty, and they stayed with audience members long after graduation. As edited by Dan Wakefield, this book reads like a narrative in the unique voice that made Vonnegut a hero to readers of all ages. At times hilarious, razor-sharp, freewheeling, and deeply serious, these reflections are ideal for anyone undergoing what Vonnegut would call their “long-delayed puberty ceremony”—marking the passage from student to full-time adult. 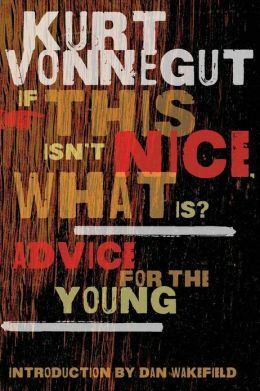 This book makes the perfect gift for high school or college graduates—or for parents and grandparents who remember Vonnegut fondly and want to connect with him in a new context.